“Made in China” products surround us, yet few consumers have anything more than a foggy idea of where in China their phones, computers, and other goods come from. Hunan Province in South Central China is not only the home of spicy food, but the world’s largest mines for non-ferrous metals used in many electronic devices. Nearly all the glass panels for Apple and Samsung smartphones are manufactured in Hunan as well. While this multibillion-dollar phone industry has been a boon for Hunan’s economy, it has also produced seriously polluted rivers and soil. In 2012, Hunan’s Xiang River, one of a largest tributaries of the Yangtze River, failed to meet national water quality standards due to high concentrations of cancer-causing heavy metals. China’s Ministry of Environmental Protection said it essentially broke its scale for water quality, warning the river should not to come in contact with humans nor be used by industries or agriculture. A year later, a cadmium-tainted rice scandal that made international headlines was traced back to Hunan’s immense heavy metal soil contamination. 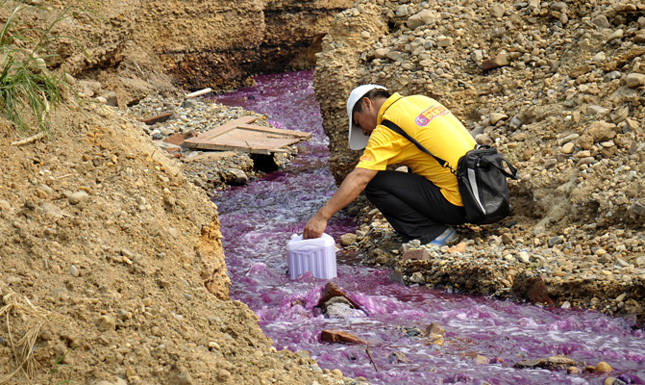 In the past, citizens and civil society groups felt powerless to confront the industries responsible for creating Hunan’s filthy and foul rivers. However in 2011, this began to change with the local grassroots group, Green Hunan. In a mere five years since being formally registered as an NGO, Green Hunan and its network of citizen river watchers has become a trusted partner of the overwhelmed municipal and provincial environmental authorities, helping to crack down on polluters. “Many Americans may think there is no way for Chinese people to protest, but I want to show that this is changing. We are protesting and the government is listening,” said Green Hunan Co-Founder and Research Director Sun Cheng at the Wilson Center on November 3. The roots for Green Hunan stretch back to 2007 when a group of freshly graduated university students met volunteering for river clean-ups. Three years later, Green Hunan received a modest grant from the Colorado-based Global Greengrants Fund, hired its first full-time employee, and organized its first formal project. Today, the NGO has 13 full-time staff, a river watchers network with more than 400 volunteers, and a robust funding model with more 90 percent of funds coming from domestic sources, said Sun. 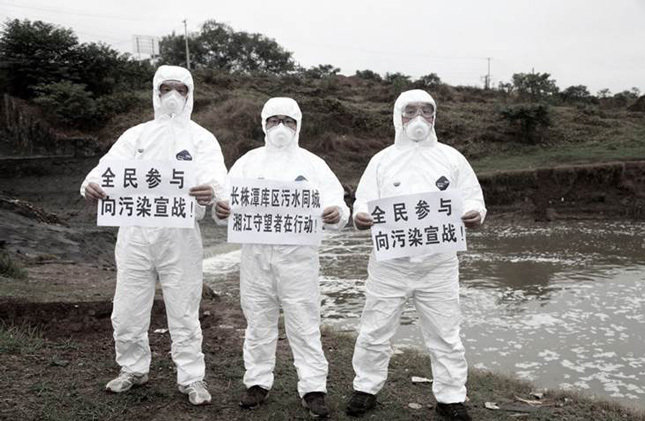 Green Hunan staff have staged environmental protests, viral social media campaigns, fundraising walks, and letter-writing campaigns to city mayors. One photo protesting a planned dam along the Xiang River received over 300,000 views within the first 24 hours on China’s popular social media platform, WeChat, and led to a government intervention that postponed the project until an environmental impact assessment was approved. Perhaps most notably, Green Hunan became the first environmental NGO invited to assist in the 13th Five-Year Plan planning process by the municipal government of Changsha, the provincial capital. One of the most devoted of the NGO’s network of river watchers is Wei Song, a convenience store owner in a heavily industrialized zone near the Xiang. “[Industries] are polluting the land I live on and the water I drink every single day; I cannot pretend nothing happens here,” he told Sun. After joining Green Hunan’s volunteer network in 2012, Wei received basic training on water sampling and began monitoring a sewage pipe where four factories dumped untreated waste late at night. After taking samples for 20 consecutive nights he submitted the evidence to the Xiangtan Environmental Protection Bureau, the local authority responsible for monitoring and enforcing environmental rules. Prompted by this evidence, the bureau shut the factories down and levied daily fines for violating emission standards until improvements were made, Sun said. During subsequent years, Wei continued to collect water samples and contributed to more than 30 investigations of local factories, according to Sun. His passion for the work was so great, when he got married, he and his bride setup a photoshoot in front of a sewage pipe on the Xiang. Images from the set went viral on social media. The river watchers network has served as an effective early warning system for local Environmental Protection Bureaus, but Green Hunan hopes to expand the network’s data quality with more stringent sampling protocols going forward. “We need to put more ‘science’ in ‘citizen science,’” said Sun. The organization’s water testing techniques only cover pH and appearance with little protocol set for sampling locations and frequency. In contrast, water monitoring groups for the Chesapeake Bay, the United States’ most monitored and studied estuary, usually test for more than 20 elements, including pH, salinity, turbidity, dissolved oxygen, total nitrogen, and phosphorous, with strict protocols for data accepted by the Environmental Protection Agency. Sun was recently able to visit several NGOs around Washington, DC, as part of a one-month fellowship with the National Committee on U.S.-China Relations, including the Anacostia Riverkeeper and Alliance for Chesapeake Bay. With just a glimpse into their work, he said he was inspired by their data collection methods, interpretations, and creative visualizations. Sun said he is now confident on the future direction for Green Hunan: better data visualizations for expanded public reach, engagement with scientists to improve water sampling credibility, and an exchange program between the United States and China to help encourage citizen science. Currently, there are 44 real-time water quality monitors maintained by the municipal Environmental Protection Bureaus along the Xiang River, but the data is only viewed by the government. This data needs to be more accessible and better communicated to engage more public attention on pollution problems, Sun said, and Green Hunan can help do that. Undoubtedly, there is still a long way to go, but Green Hunan shows there is growing political space for environmental groups to leverage action on information transparency and enforcement. Just a decade ago, grassroots action was a rare occurrence; last year, Green Hunan submitted more than 20 policy recommendations on information transparency and water governance to local Environmental Protection Bureaus, said Sun. Water monitoring has not come without danger, as some volunteers have experienced threats of violence and property damage by worried factory owners. But as China’s central government embraces a top-down “war on pollution,” Green Hunan’s bottom-up approach represents a crucial second front. Jillian Du is a researcher for the Wilson Center’s China Environment Forum. Sources: Beijing University, China Dialogue, ChinaFile, The New York Times, . Photo Credit: Mao Jianwei, a Green Hunan volunteer, tests a discharge stream; Xiang River watchers protesters at the Changzhu Reservoir, used with permission courtesy of Green Hunan.